These gowns are used to prevent direct contact transfer of infective agents from the surgical team to the operating wound and vice versa. These gowns prevent dispersal of skin scales to the operating theatre air only if they are made from a suitable material. Disposable patient’s gown– these gowns are required by the doctors, nurses and other staff during operations. As these gowns ensure proper movement while operating. Disposable Surgical gown– these gowns are manufactured to remain at par with the international quality standards and norms and these are manufactured using optimum quality raw material. Disposable Surgeon Gown– these gowns are made of sun bond, double overlapped, set in sleeve packing and are universal fit. These gowns are eco-friendly and hygienic as well. Hygiene– Disposable gowns enhance infection prevention and also reduces the opportunity for cross- contamination. Prevention from infections ensure proper hygiene. Disposable Personal Protective Equipment (PPE) is a critical component of any facility’s efforts to prevent and control infections. It should be used as prescribed and intelligently. Atlas Infiniti satisfies this thing. Protection levels – Protective apparel must meet minimum performance standards for strength, barrier protection and fluid resistance to ensure safety of HCWs and patients. The appropriate disposable gown manufacturer keep this thing in mind and Atlas Infiniti provides the same. 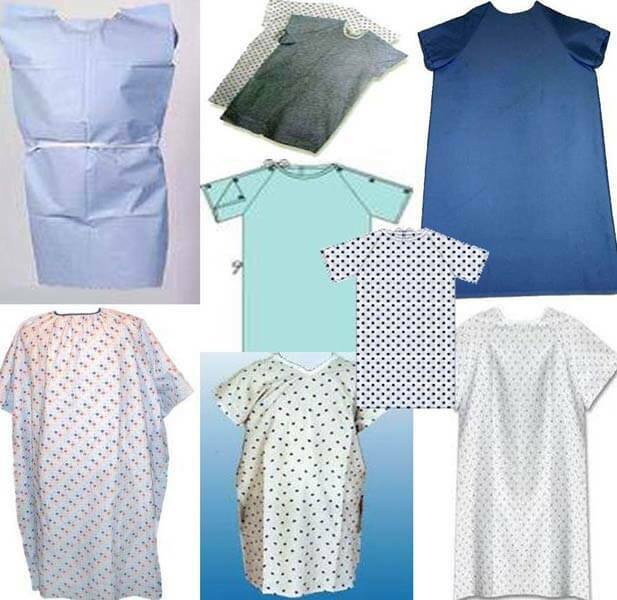 Comfort– While performing jobs in hospital the gowns worn by doctors, nurses, patients and other healthcare staff their apparels should provide proper comfort. Comfort is the thing which makes any person more focused to his/her work. Atlas Infiniti supplies disposable gowns with proper comfort. Not only this, Atlas Infiniti provides gowns in various sizes and shapes to meet the requirements of customers. We offer a high quality patient gowns made of SMS non-woven fabric. This fabric is of high quality and latest development in non-woven fabric. Also our disposable gowns offer a wide variety of sizes and colors and can also be customized as per different needs. Our gowns offer high level protection without compromising on quality and comfort. We offer spun melt composites such as BVB (Breathable Viral Barrier) and other film-based composites. They are easy to wear for prolonged surgeries and meet all the demands of surgical use. The soft knit cuffs are not only comfortable but their length facilitate closed gloving. They are compatible with ethylene oxide, steam and gas plasma sterilization. We are best Disposable Gown Suppliers related to health care. Producing these gowns suppliers in India and providing very good quality of products to all customers worldwide is very important. Contact us for a delightful experience and a trusted word of mouth!